Hi. I'm Gemma Grayfield. I used to be a librarian in Los Angeles, but when I came here to Destiny, California, home of superstitions, to visit my good friend Rory Chasen, I was asked to run the Broken Mirror Bookstore. That's right next door to the Lucky Dog Boutique where Rory is the manager. My former boyfriend, Frank Shorester--whom I was avoiding--decided to follow me here. On top of that, I started flirting with a couple of men I met here in Destiny. And when one of them was murdered... well, it was a good thing that Rory had already solved one murder, since she had to work on helping to clear me. That situation has been memorialized in a book, KNOCK ON WOOD. Now, let me tell you why I offered to blog here today. We sell copies of the premiere book on superstitions at the Broken Mirror: The Destiny of Superstitions. We also sell other books relating to superstitions and Destiny. As a librarian by background, I've read them all. As a result, I figured I would tell you here about some superstitions I learned about regarding this month, November. Rory tells me she has already let you know about some Thanksgiving superstitions, such as the person who gets the larger portion of a turkey wishbone, when two people break it, is the one whose wish comes true. And although it's not specific to November, you're possibly aware that we just had a Friday the 13th--supposed to be bad luck. Now, there are some superstitions that say it's bad luck if a bird flies into your home, but if it happens to be a robin in November, that's good luck. It's a good thing to marry in November, since you'll have a wonderful marriage and life. Watch out if flowers start blooming in November, or if the weather is warm, since they are both indications a bad winter is on its way, but if you hear thunder in November and you happen to be a gardener or farmer, that's a good sign since it means lots of crops. I'll stop now, although I do know a few more pertinent superstitions. I'm just glad I had this opportunity to say hi, and hope I can blog here again sometime. 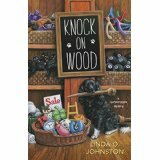 KNOCK ON WOOD, the second Superstition Mystery by Linda O. Johnston, is an October 2015 release from Midnight Ink. Thank you, Jen. Most were new to me, too, till I moved to Destiny. Haven't heard that as a superstition, Dora, but I've no doubt that it's true. Dirty and smelly, too. I don't really believe in superstitions but now you have me changing my mind a bit. We were married in November and have had a great marriage and life. It will be our 42 anniversary next Monday. There's one I will go with! Congratulations, and Happy Anniversary! So glad that good superstition has come true.